Doctors for the 99 Percent march from Zuccotti Park to St. Vincent’s Hospital to demand its reopening and health care for all in 2011. $32 trillion. You may have seen this number in corporate media coverage and Republican propaganda. It’s the estimated cost of universal health care over a 10-year period. Of course what the editorial board of The Washington Post leaves out (though you think they’d know better) is any comparison to what we’re currently spending. Compared to what we’re currently spending, universal health care or single-payer health care would save us $17 trillion over 10 years. In order to demonstrate this, we just need a couple of numbers. The first number is how much we currently spend on health care per year. This is a number called the National Healthcare Expenditure (NHE). NHE measures everything we spend on health care — both public and private. In 2015, the NHE was $3.2 trillion or $9,990 per person per year. That $9,990 per person makes us the most expensive healthcare system in the world. It was this way before the Affordable Care Act (ACA) as well. In 2013, the Organization for Economic Co-operation and Development (OECD) calculated the average worldwide healthcare spend per person at $3,453. Back to our number: $3.2 trillion in 2015. It increased to $3.4 trillion in 2016. As you can see, the amount of spending per year doesn’t stay the same. It grows on a yearly basis. So the second number we need is the growth rate. According to the study titled “National Healthcare Expenditures, 2016-2025: Price Increases, Aging Push Sector to 20 Percent of Economy,” health care costs in the United States are estimated to grow at an average annual rate of 5.6 percent from 2016 to 2025. If we apply this growth rate over 10 years, and add up the costs, our current healthcare system will cost $49 trillion. $49 trillion (current system) — $32 trillion (single payer) = $17 trillion in savings. 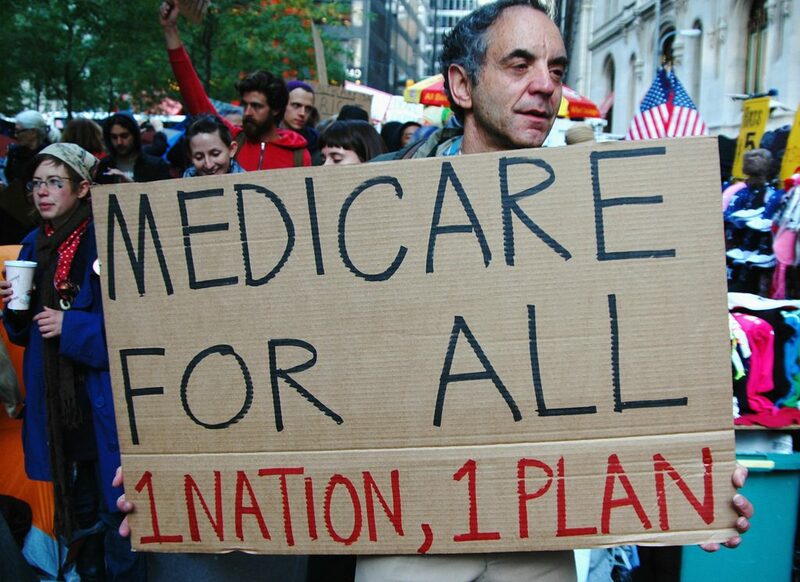 Over a 10-year period, universal health care or a single-payer system would save $17 trillion. Yes, you read that right … universal health care would cost $17 trillion less over 10 years. A universal health care system would save us $1.7 trillion a year. The problem is that certain industries have very powerful lobbies. And these industries spend a lot of money on advertising to make sure that additional $17 trillion goes to them. You’re not going to believe this, but nowhere in the article do they mention that it would also save us $17 trillion over our current system. Instead they focus on how federal spending would increase. Excerpt from the Urban Institute’s analysis of Bernie Sanders’ single payer plan. The first column is an estimate for 2017, the second for 2017-2026. Over 10 years roughly $22 trillion of private spending moves to public spending. You know why federal spending would increase? Because we wouldn’t be paying for insurance out of our own pockets. The reason for the increase is simply that private spending moves to public spending. As illustrated in the excerpt from the Urban Institute’s analysis of universal health care, roughly $22 trillion of private spending on health care moves to public spending. Overall, however, we’d spend $17 trillion less over 10 years and we could insure everyone. The next time someone tells you we need to reform health care, show them how we could easily save $17 trillion if we just did what every other developed country in the world does when it comes to health care.